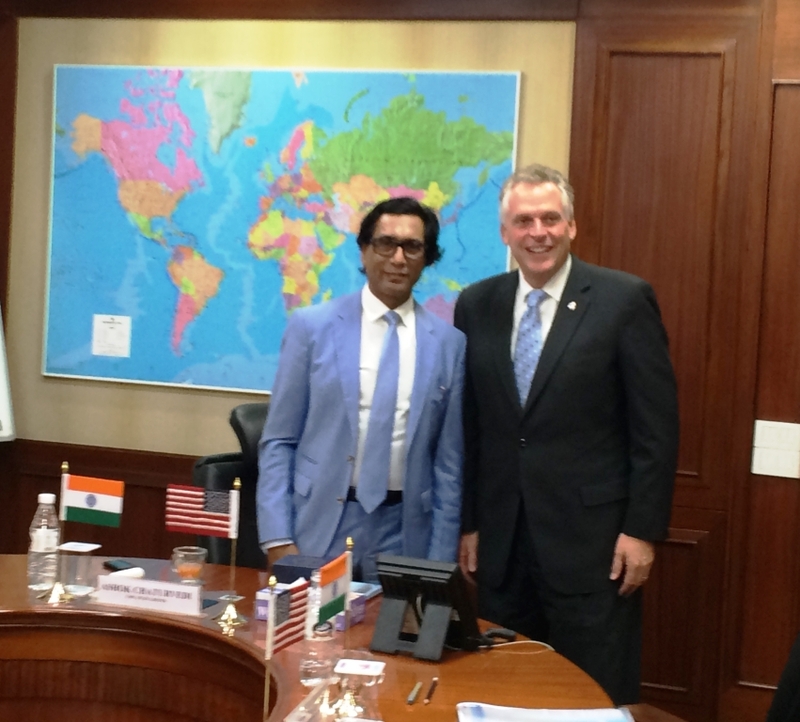 Uflex Limited, a truly global player in flexible packaging & plastic film manufacturing, hosted His Excellency Governor, Commonwealth of Virginia, Honorable Terry McAuliffe during a visit to the headquarters of India’s largest flexible packaging company. His Excellency is currently on a business mission to India meeting successful and progressive organizations that have been expanding globally. Uflex became an apt choice with international operations and transactions accounting for 54% of Uflex’s total revenue during Financial Year 2014-15. Notably the sales revenue from Uflex’s Kentucky operations in the United States of America during FY 2014-15 stood at approximately USD 137 million out of the total consolidated revenue of around USD 1 Billion. Interacting with the Leadership of Uflex, His Excellency, Governor of Virginia said, “We are indeed very pleased to meet Uflex and are excited to see their capabilities in the realm of flexible packaging business globally. We invite and welcome Uflex to set up business in Virginia and assure them of full cooperation and support from our side”. Soon after the meeting that lasted for over an hour, Mr. Ashok Chaturvedi, Chairman & Managing Director, Uflex Limited in an official statement said “We had a very fruitful discussion with H.E. Governor, Commonwealth of Virginia, Honorable Terry McAuliffe and his delegation. Uflex’s three pronged approach of fostering innovation to create differentiation; proximity to customers and the ability to offer entire gamut of end to end flexible packaging solutions globally augurs well with Virginia’s business prospects. We are excited to take this discussion to the next level. It is extremely heartening to see a close coordination for enhancing business ties between India and United States of America particularly when my country and Brand India is making great strides under the aegis of our Hon’ble Prime Minister, Shri. Narendra Modi”. Over the years Uflex has emerged as one of the strongest global players in flexible packaging & plastic film manufacturing, with State-of-the-art plants in India, Dubai, Poland, Egypt, Mexico and Kentucky and cumulative installed capacity in excess of 435,000 TPA. With the best brains and cutting - edge technology by its side, Uflex serves as a one stop shop flexible packaging solution provider across varied sectors spanning USA, Canada, South America, UK, Europe, Russia, CIS countries, South Africa and other African countries, Middle East and the South Asian Countries. Today, Uflex enjoys a formidable market presence in over 140 countries across the globe. Accompanying His Excellency in the high level delegation was Mr. Maurice A. Jones, Secretary of Commerce & Trade, Commonwealth of Virginia and Mr. Martin J. Briley, President & Chief Executive Officer, Virginia Economic Development Partnership among other dignitaries. Uflex Limited is the largest fully integrated Indian flexible packaging solution provider to a range of clients across industries both in India and overseas. It enjoys a formidable market presence in more than 140 countries. Since its inception back in 1983, Uflex has grown from strength to strength to evolve as a truly Indian Multinational with consumers spread across the world. Uflex today has state-of-the-art packaging facilities at multiple locations in India with installed capacity of over 99,000 TPA. Uflex’splastic film manufacturing facilities in India, UAE, Mexico Egypt, Poland and USA have a cumulative installed capacity in excess of 337,000 TPA.